Pesticide for lawn treatments should include protection against common pests, like fleas and ticks. Summer brings the risks of both of these annoying insects to a head. They’ll cling to people and pets walking through grass or trees. Once attached, they can transfer a variety of illnesses to your loved ones. Give your family some basic protection by adding flea and tick control to your lawn care regimen. Fleas can quickly overtake your home. Georgia summers are humid and hot, providing fleas with the perfect environment for propagation. They quickly take root in your carpets and furniture, waiting to jump out and bite at a moment’s notice. It’s no surprise when you realize female fleas lay up to 2000 eggs each. Fleas and ticks spread disease. While flea bites turn into red, itchy lumps, they’re not just a source of irritation. They’re also a common source of illness, and some of them are quite serious. The plague responsible for wiping out millions during the Middle Ages was spread by fleas, and while treatments are much more effective today, fleas still carry the bubonic plague. You can also catch typhus or cat-scratch fever from fleas in addition to many tick-borne illnesses. Ticks are known for spreading Lyme disease, a mysterious illness which affects every facet of life. However, they’re also capable of transmitting Rocky Mountain Fever, babesiosis, POW Virus and other life-threatening conditions. At their least destructive, both fleas and ticks can cause infections at bite sites, and they’re pretty gross to deal with. Fleas and ticks attack both people and pets. If you have pets, you know the problems fleas and ticks can cause them. Itching, scratching and constant irritation can have a big impact on your pets’ behavior. An infestation can literally ruin the vibe in your home and seriously hurt the bond you have with them. However, both types of the pest can also move from your pet onto you. Treat your yard for fleas and ticks to keep your pets and your human guests and family members happy and healthy. A dual approach is needed to clear up flea and tick infestations. Whether you find a flea on your cat or on the couch, it’s important to treat your environment and your pets simultaneously. Flea dips will immediately eliminate fleas, ticks, and eggs left on your pets. Preventive treatments lasting a month or more can be applied as well, to keep your pets pest-free for long enough for your yard and home to improve. 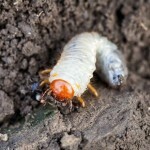 Indoors, a flea bomb and washing pet beds and blankets in hot water can help take care of creepy crawlers, and pesticides left around windows or the foundation of your home can keep them out. In the yard, topical treatments can disrupt the flea and tick lifecycle, so that they won’t remain in your yard. 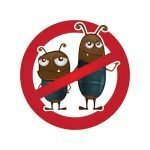 Unfortunately, because insecticides have such a hard time of treating fleas at certain stages, repeat treatments of your environment and pets may be needed a week or two later. If you have questions about the best pesticide for lawn pests, call (678) 648-2556 today to get your answers from the pros at Think Green.